Modern Coin Magic: Think you know your Coin Magic? Prove it! Think you know your Coin Magic? Prove it! You think you're pretty coin magic savvy? Edge Palm and stack work are child's play to you. You sleep with a jumbo coin in Mutobe Palm. You did your first Reverse Matrix before you could spell your name. Yes, you can walk the walk, but can you TALK the TALK? 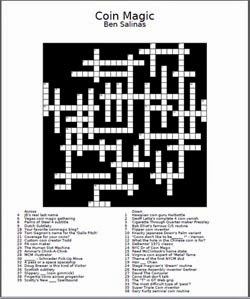 This is the first ever (as far as I know) Coin Magic Crossword Puzzle! This won't make your palms bleed, but it may cause you to scratch your head a few times and access some lost chunks of long-term memory. But, don't worry I included an Answer Key. So, grab a pencil, sit close to your magic bookshelf, pull up the Google homepage, and let's dig in! Use the text links above to download a PDF version, or solve it on-line!